Sunday morning was a bit of a challenge. The hotel room my family was staying in was next to another family that had gathered at the hotel that weekend for something of a reunion. I'm sure they were all very happy to see each other after some indeterminate period of time, but I have to say, I'm not sure a lot of "quality time" was being had by the 30 or so folks milling in and out of that room at 330am. I'm just guessing, but the bourbon was flowing a little freely. Ask me how I know it was bourbon. Anyway, Sunday morning rolls around, and being the gallant lad that I am, I offer to abscond with the munchkins while Mom catches a few quiet ones. 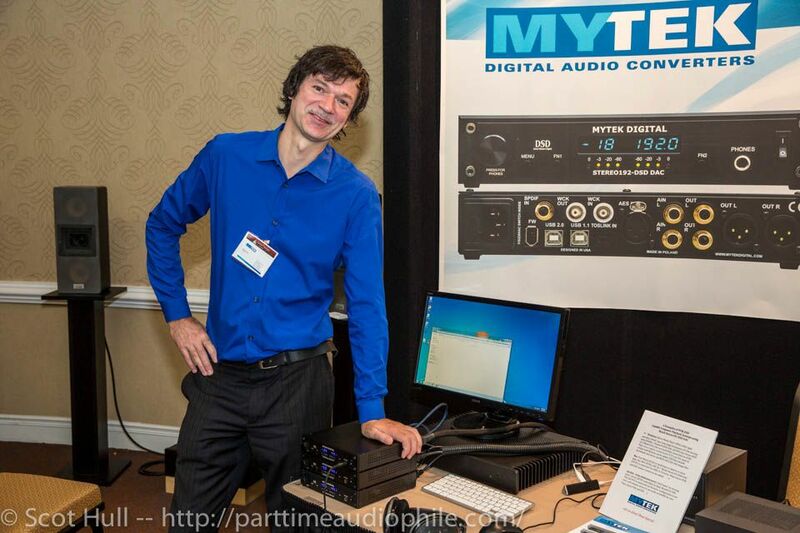 Unfortunately, not a lot was open early at the show, but one booth that was, was Mytek Digital. I’ve been meaning to catch up with Michal Jurewicz of Mytek Digital for some time now, so it was nice to chat with him without the crowds milling about. His trick DAC-Stack was on display, allowing him to daisy-chain a set of his stereo boxes to a computer source capable of sending discrete channel outputs. Voila, instant surround sound. It was pretty nifty at New York in “live” mode with a set of Sony speakers and it was pretty nifty here, too, on headphones (though I think it’s more impressive on the big speakers). I now have one of the Mytek DACs, so I hope to be able to work a review into the flow at some point. By way of an aside, my kids loved the tall, luminously-blue-shirted man. He was “very nice” and played them some “nice music”. Hey, I was able to keep the twins seated for about 15 minutes, which is no small feat. Hooray for Michal! By the way, Michal mentioned that there might be a new product on the distant horizon, with a fully dual-mono implementation of his DSD-capable DAC, something with a more audiophile-friendly footprint, too (read: larger chassis). Pricing and timing is still TBD. Thats funny because we are neighbors from Warsaw, Poland. 11,303,407 Visitors ... and counting!